We believe that the quality of an institute's faculty determines the quality of its academic delivery. 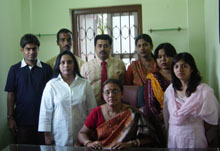 We have therefore, taken care to handpick our academicians as experts from various sectors. Guest lecture programmes are a regular feature at ICEMI providing valuable insights and honing the minutest details of academic students. Mr. Sudip Chakraborty - Faculty,MBA, MPhil. Mr. Sumit Chakraborty - Faculty,MBA. Mr. Debraj Ray - Faculty,MPM.